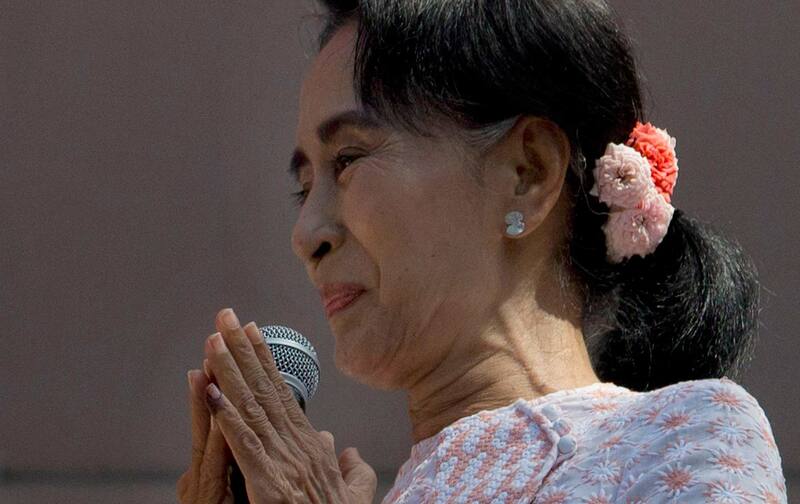 Burma: Democracy with an Asterisk? Burma’s Constitution awards a quarter of its Parliament to the military. But that’s not Aung San Suu Kyi’s biggest problem by a long shot. Voters went to the polls last Sunday in Burma to elect a new Parliament. The opposition National League for Democracy—Nobel Peace Prize–winner Aung San Suu Kyi’s party—scored an impressive victory. According to the early returns, the NLD is on track to win over 80 percent of the vote and capture a sizable majority in Parliament. And yet the election carries with it an asterisk—just like the New England Patriots’ 2015 Super Bowl victory (deflated footballs) or Barry Bonds’s home-run record (steroids). In Burma’s case, the asterisk involves the 25 percent of seats set aside for representatives of the military. This bloc also holds veto power over any constitutional changes. And, according to the Constitution, Aung San Suu Kyi can’t be president. Tell that to all the people celebrating in the streets of Burma’s capital and throughout the country. The ruling party may well believe that it’s created the façade of democracy in order to secure foreign investments and maintain its hold on power. But that doesn’t mean that its perception jibes with reality. Nor does it follow that the Obama administration’s gambit is a faulty one. Diehl thinks that he’s as cunning as the Burmese junta in identifying the weaknesses of Obama’s strategy. More likely, Diehl is as intellectually torpid and politically blinkered as the junta is. Also, democracy with asterisks is more the rule than the exception. And when it comes to tricky transitions, such asterisks can be a useful compromise. The Polish opposition negotiated a compromise in 1989 very similar to the one embraced by the Burmese dissidents. And, at the time, plenty of critics responded with the same kind of hostility as Jackson Diehl. The Solidarity trade union, the skeptics lamented, had made a lousy deal with the devil. In spring 1989, Solidarity activists sat down with government representatives in the legendary Round Table talks. Out of those discussions, the two sides agreed to parliamentary elections on June 4. All of the seats of a newly created Senate would be up for grabs. But the Communist Party and its satellite parties retained two-thirds of the seats in the more important chamber known as the Sejm (considerably more than what the Burmese junta demanded). The election results were a surprise. Very few people expected that Solidarity would win virtually every seat it contested (it lost a single Senate seat to an independent). Since they formed a parliamentary majority in the Sejm, the government-affiliated parties selected the president—the architect of Martial Law, Wojciech Jaruzelski—who then proposed his right-hand man, Czeslaw Kiszczak, as the prime minister. But, in another surprise, Solidarity managed to woo away several of the satellite parties to create a ruling coalition and undermine support for Kiszczak. In other words, what had started out as a major democratic asterisk turned into one of the most exhilarating exercises of democracy in modern history. In September 1989, Solidarity formed the first non-Communist government under Prime Minister Tadeusz Mazowiecki. It was just a matter of a month or two before the rest of the region followed suit in spectacular fashion. All democracies, at some level, deserve an asterisk or two. It’s in the very definition of democracy that they are works in progress. Consider democracy in the United States. At most, an estimated 25 percent of the population in the 18th century was eligible to vote. After all, women, slaves, and white men without property were all barred from the polling booths. And that situation lasted many decades. Formally, African Americans received the right to vote in 1865 with the 14th Amendment, but in fact many African Americans would only begin to vote with the passage of the 1965 Voting Rights Act. Women, meanwhile, had to wait for suffrage until 1920 and the passage of the 19th Amendment. Felons remain disenfranchised to this day. Virtually all democracies created in the 18th and 19 centuries had a restricted franchise. In the 1780s, for instance, approximately 3 percent of the population of England and Wales formed the electorate. Of course, many asterisks continued into the 20th and 21st centuries as well. Women won the right to vote in Iraq in 1980, the Central African Republic in 1986, in Qatar in 1999, and just this year in Saudi Arabia. Democracies are also subject to more structural problems. The inordinate influence of money on American elections, exacerbated by the Citizens United decision of the Supreme Court in 2010, has reinforced the sad reality that only the wealthiest citizens, or those capable of attracting the support of the wealthy, can successfully run for office in the United States. Government restrictions on the media—as is the case in Russia, among other places—also produce questionable election results. The prior approval of candidates by unelected officials—in Iran, for instance—has also limited the full exercise of political freedoms. Democracy is about learning from mistakes. Even in our “advanced democracies,” we continue to commit unpardonable errors that our wiser heirs will identify and correct (or not). From 1988 to 2012 only 477 foreign companies invested in Myanmar, with a total Foreign Direct Investment (FDI) of US$4.1 billion. In the last fiscal year, this figure has doubled to over US$8 billion and 895 companies from 38 countries have invested in the country, according to a new report from the International Trade Union Confederation (ITUC), Foreign Direct Investment In Myanmar: What Impact On Human Rights? Real estate prices in downtown Yangon now rival those of Manhattan. And the Asian Development Bank expects Myanmar to have one of the region’s fastest growth rates of seven to eight per cent per year in the coming decade. Diehl makes a fundamental mistake in connecting this foreign investment to the continued political fortunes of the ruling elite. Rather, as in every other country in transition over the last 25 years, the elite is trading its political status for economic enrichment, using insider knowledge and contacts to find a secure place in the new order. If I were an unscrupulous ruling party official in Burma, I would welcome the opportunity to hand over all of the country’s most challenging problems of governance to the opposition and focus instead on making boatloads of money in the oil or lumber industries. “Our USDP lost completely,” one member of the ruling party, Kyi Win, said. “The NLD has won. Daw Aung San Suu Kyi has to take responsibility now.” That means that Aung San Suu Kyi and the NLD must take responsibility for myriad armed conflicts, an antiquated economy, rampant corruption, drug problems galore, a challenging relationship with China, and much, much more. The victory of the NLD will not, after all, magically pull Burma together. If anything, it may well accentuate the divisions in the country, as democracy often does. Aung San Suu Kyi has barely said anything on behalf of the Rohingya, the dispossessed Muslim minority living in the Rakhine state that abuts Bangladesh. The NLD also refused to allow any Muslim candidates onto their election list. Even so, the extremist Buddhist party Ma Ba Tha—and you thought all Buddhists were peace-loving meditators?—tried to portray the NLD as a party of Islamists. The Muslim-Buddhist conflict is but one of many in Burma. There are eight main armed factions, largely structured along ethnic lines: the Karen, Kachin, Karenni, Chin, Mon, Rakhine, Shan, and Wa. And there are just as many breakaway groups from these major groups. Last month, the government signed the Nationwide Ceasefire Agreement with eight paramilitary groups, effectively ending armed conflict throughout much of the country. It’s the first time any armed faction representing the Karen people has participated in a peace agreement since 1947. That’s the good news. The bad news is that seven armed factions—including the United Wa State Army and the Kachin Independence Army—refused to sign the agreement. It’s not clear whether the NLD will bring any greater credibility to the negotiating table, particularly when dealing with the issues underlying the insurgencies. For instance, Aung San Suu Kyi was put in charge of a commission looking into a controversial mining project responsible for confiscating thousands of acres from farmers, relocating 66 villages, providing little in the way of compensation, and polluting the environment. The commission endorsed the project, and local protests continued. Ignoring the Rohingya, keeping Muslims off the NLD election list, backing a controversial mining project: Aung San Suu Kyi has indicated in so many ways that she’s not interested in remaining an icon dressed in saintly white. She fully intends to be a politician and wrestle around in the mud. So, though she can’t become president for now, she won’t hesitate to wield as much power as she can manage. “If I’m required to field a president who meets the requirements of section F of the Constitution, alright then we’ll find one,” she told the BBC after the preliminary results were in. “But that won’t stop me making all the decisions as the leader of the winning party.” Maybe Hillary Clinton, who met with Aung San Suu Kyi in 2011, has had more influence over the Burmese leader than she ever anticipated. The NLD has to be careful. The party also won back in 1990, but the government at that time refused to acknowledge the results. The military could decide to hit the replay button. But the government already respected the semi-democratic by-elections in 2012. And, as Aung San Suu Kyi has said, “the times are different, the people are different.” The military has a number of incentives to let the current election results stand. It’s not just the influx of foreign investment. The military also finds it useful to have the support of the United States and Europe to counterbalance the giants in the neighborhood, China and India. And, unlike in Egypt, the military can’t portray the opposition as a threat to Western interests. Aung San Suu Kyi is not just whistling in the dark. She can count on people power from below and superpowers from abroad. The next task is to expand her maneuvering room. Gradually eliminating the most prominent asterisk attached to Burma’s democracy—and proving Jackson Diehl wrong about the country’s political future—is no doubt on the top of her agenda. But given all the other challenges facing Burma today, that’s probably the least of her problems.